Stephen Offord of Stephen Offord Coaches from Westham near Eastbourne, was one of the last to take the Euro5 version of the DAF powered Van Hool TX16 Alicron. It followed two earlier DAF powered Van Hools (another TX16 and one TX15), which like the latest one were sourced from Arriva Bus and Coach. The coaches were all bought within a two year period, which is the first time Stephen has bought so many vehicles in such a short space of time. The operator has enjoyed a good partnership relation with the dealer since acquiring the vehicles. Arriva Bus and Coach invited Chris Peat down to the operation to find out more. 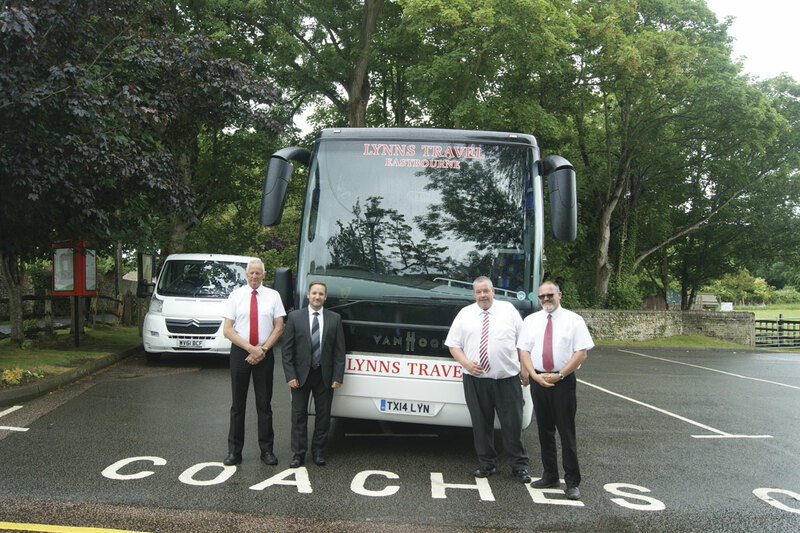 One of the first things to notice about the fleet at Stephen Offord Coaches is that they are in Lynn Travel livery. Stephen was keen to note that Lynn Travel is his mother and father’s holiday business, for which he provides the transport. 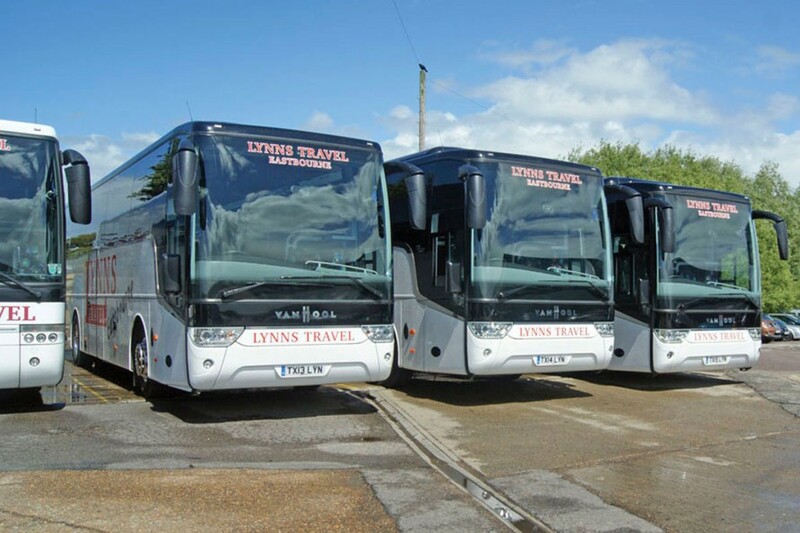 Although his firm takes care of Lynn Travel’s work, he emphasised that they are two separate companies. His operation is based next door to Euro Trucks Eastbourne, which is a handy location as the company provides parts and servicing for him. His father was a coach driver in the 70s and 80s, but once the operation he worked for went under, he decided to set up his own business. He put together a tour programme and self hired coaches. As the business grew, he got his own vehicle. Stephen was made the operations manager at the relatively tender age of 18. This led to a public enquiry by the Traffic Commissioner to investigate why one so young was taking on this mantle. Everything went well in this and one of Stephen’s first jobs onboard coaches, before he could drive them, was making teas and coffees for passengers. These days, with his operation doing well, Stephen said he is getting a good share of a ‘dying industry’. Simply providing a good service is something that helps in this. He does door to door pick ups in Eastbourne and surrounding areas. 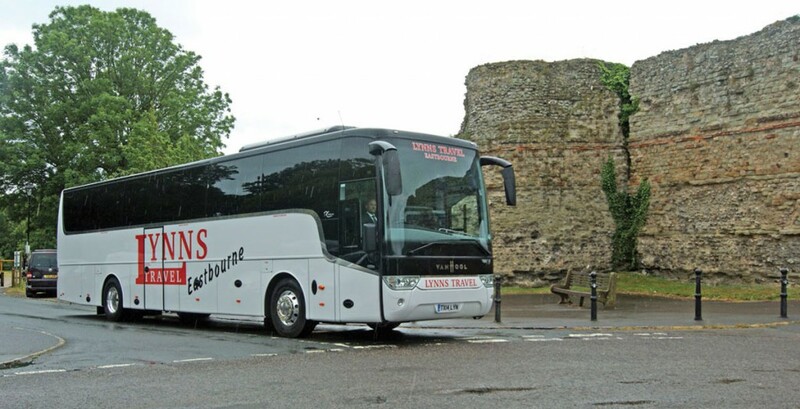 The tours he provides the transport for are to destinations across the UK and into Europe. His coaches have gone to numerous destinations, including Rome, Budapest, Paris, Poland and Switzerland to name a few; anywhere that is reachable in two days of travel. Stephen’s relationship with Van Hools started with Scania based models of the Belgian marque. This was back in 1999, when he was just starting out operating on his own. All of the company’s current seven 49-seaters are Van Hool, four of which are Scania based, the others DAF powered. For his latest acquisitions, one of the things that made Stephen come back to Van Hool was the continuity in design of the vehicles. For instance, his newest Van Hool has the same moquette and curtains as those he purchased in the early days. Taking a look at a line up of his fleet in his yard, he remarked how little the front design had changed between his latest and his older Van Hools, noting the older ones certainly did not look dated or out of place. The TX16s, his latest Van Hools, are slightly longer vehicle than the previous TX15. The latter is 12.2m, the TX16 12.9m although both have 49 Van Hool seats. This size difference may be less than a metre, but it makes all the difference, especially to passengers who notice and positively comment on the extra legroom. It has also allowed an extra cupboard to be added, something he said all his drivers like, as well as allowing more flexibility for luggage. The extra space is the reason why Stephen prefers the TX16 over the TX15. All three vehicles feature a ZF EcoLife gearbox, a drinks machine and two fridges. Stephen’s TX16s were ordered at the same time, with their delivery and payment staggered. The first entered the fleet in summer 2014, with the latest one arriving March this year. The first was built in Van Hool’s Lier plant in Koningshooikt, Belgium, whilst the other was manufactured in the former Eos site in Bree, Limburg. At the top of Stephen’s mind when choosing Van Hool was the customer experience, the passenger environment. He did say he noticed a difference between the DAF and Scania based vehicles with the same body in that the latter seemed to handle hills better. However, this difference was considered minimal, with the DAF version not considered underpowered. In terms of fuel economy for the TX16, Area Sales Manager, David Brown, said it commonly works out at 12mpg. One of the main factors behind his decision was the fact David ‘would always pop his head in to say hello when he was giving us a flyer’. The fact he ‘showed his face every four weeks or so’ was impressive for Stephen, who said he had not known anything like it from other dealers. As well as that personal touch, good after sales service was something else Stephen listed as being an attractive proposition with Van Hools from Arriva. On arriving, one of the first people I met was John Clarke, Arriva Bus and Coach Technical Specialist, who was doing some general maintenance work on one of the Van Hools. John is one of six technicians who look after new vehicles sold by the dealership, a key aspect of the business’s after sales support. They are based across the country, supporting all areas of England, Wales and Scotland. The company is looking for a seventh one to expand its support and potentially another for Ireland. The technicians have been given new Volkswagen vans which provide even greater capacity for tools and parts than the previous smaller vehicles they used. Marketing Manager at Arriva, Laura Finnigan, said providing this is all part of the company’s efforts to work in partnership with its customers, fully aiding them. The three new Alicrons acquired by Stephen Offord in the past two years. Stephen said he would be happy to stay with Van Hool for future new full length coaches. He said when he drove demonstration vehicles of other marques he ‘wasn’t as impressed’. Amongst the list of things he prefers about Van Hools is the ‘user friendly’ nature of them. This is a sentiment his drivers echo. During the lunch break, when the two Arriva representatives had left the vicinity, the drivers said they liked the layout and drive of the newest TX16. When it comes to when he will buy another new Van Hool, Stephen said buying three in two years was a ‘big jump’, having never previously bought so many in such a short space of time. Is he getting to a stage where he could be adding one new vehicle every year? He finds himself pondering whether this would be feasible, mentioning the possibility of part exchanging a Scania for another DAF based model. He noted doing this would change the balance in the fleet so DAF would make up the majority. As was the case with his previous three, Stephen may well take items off the standard specification list for Van Hools. Removing things from the vehicle has freed up room for him to have the extra fridge added and a cupboard. He said he never uses the term ‘executive’ or ‘luxury’ to promote his services, saying what exactly meets these standards are not well defined, with some companies using these words perhaps erroneously. He says operations like Ellisons Travel that provide the highest quality specification for top flight football clubs are truly worthy of calling their service executive. This is not to say he does not offer a good, clean, neat fleet that gives passengers a comfortable ride, as he certainly does. However, buying these premium Van Hools is important for Stephen. He says it shows customers he is ‘keeping up with the times’, introducing something noticeable for passengers, something plush. 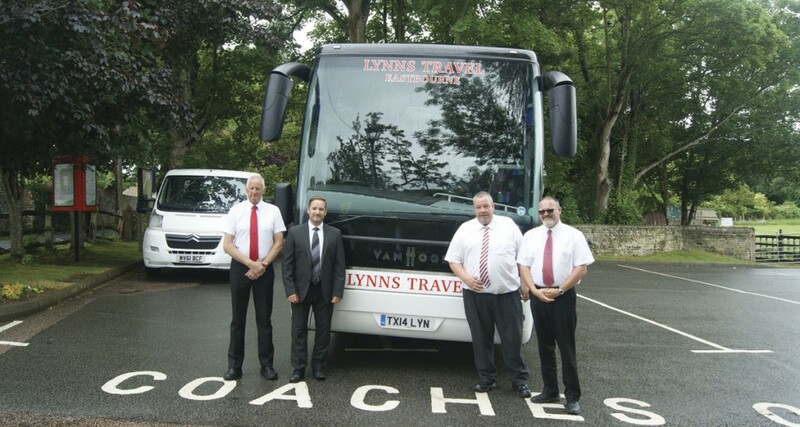 Stephen Offord Coaches purchasing new Van Hools is a success story for Arriva Bus and Coach. Stephen has nothing but good things to say about the vehicles and the aftercare service. The key message from Arriva on the day was that it is going above and beyond when it comes to looking after its customers, with no shortage of support. One of the TX16s pulls out of a junction by Pevensey Castle.